Chicago Shakespeare Theater presents a vibrantly reimagined A Midsummer Night's Dream, directed by internationally acclaimed director Joe Dowling. Shakespeare's beloved comedy is infused with raucous humor, a striking visual landscape, and eclectic musical score blending rock, jazz, blues, rock, and '50s doo-wop. "...Kebede is a very exuberant and smart Puck, but great Pucks connect in a more profound way with audiences � Puck is an emotional mischief-maker who makes us believe we can live for ever, even as he reminds us that everything ends. That more important existential landscape is here overwhelmed by the more sensual journey at the forefront of Dowling�s production." 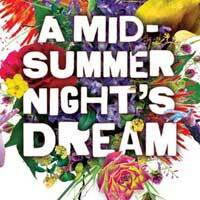 "...This "Midsummer" is a rollicking romp thanks to a feast of vibrant visuals, plus a very energetic ensemble. Celebrity watchers should note that Broadway and TV veteran T.R. Knight of "Grey's Anatomy" fame is in the cast, and he acquits himself quite nicely as the boastful amateur actor Nick Bottom, who gets transformed into an amorous donkey." "...In all, Midsummer sounds great. It looks great. It will hold your attention. There is, to paraphrase Tim Gunn, a lot of look here. But it's as substantial as pixie dust. Chicago Shakes has the means to go big with innovation and substance. Midsummer goes big, but mostly just on appearance." "...There�s an epiphany near the end of Shakespeare�s celebration A Midsummer Night�s Dream when the mixed-up quartet of wayward lovers who�ve been confoundedly mashed up over the course of a long July night discover they�re awake! They jump for joy over the unearned deliverance. It�s an absolutely natural response to the very complex �dream� from which they escape. And it�s one of the few moments in Joe Dowling�s new staging when the play�s lyrical power can hold its own with the comedy." "...Let�s Play �Recommend� that you treat yourself this holiday season to �A Mid-Summer Night�s Dream� where for a couple of hours you will enjoy some riotous humor, a beautiful visual landscape and a medley musical score of eclectic music." "...Over the years, many lovers of the works of Shakespeare have classified �A Midsummer Night�s Dream� as the one play that even non-lovers of his work can enjoy. The new re-imaginationed version that opened at Chicago Shakespeare Theater at Navy Pier last night makes it even more so. Shakespeare�s works are hundreds of years old and yet, this comedy still makes us laugh. Directed by Joe Dowling who brings some new twists to the production, this sterling 2 and a half hours of theater is bright and witty. In fact, one might call it �magical�." "..."A Midsummer Night's Dream" was visually spectacular. Designs by Todd Rosenthal (scenic) and Fabio Toblini (costume) created stark worlds between the royalty, fairies and acting troupe. Each reveal was exciting and the architectural interplay among the pieces was gorgeous." "...The new production of "Midsummer" that has just arrived on the Chicago Shakespeare stage, is the work of veteran director Joe Dowling, who has served as artistic director of both Ireland's Abbey Theatre and Minneapolis' Guthrie Theater. It is an eclectic but uneven, anachronism-filled mashup of time, place and styles that tries (too desperately) to be hip. And despite a number of fine performances, and a gorgeous "flower power" set by Todd Rosenthal, the whole thing ends up feeling more clunky and exhausting than beguiling. Subtle it is not, and often the poetry and emotion get lost. But maybe this is just a "Midsummer" in keeping with the temper and tempo of the moment." "...Certainly, Shakespeare's most popular comedy, Chicago Shakespeare Theatre offers a terrifically cast, often visually arresting, highly hilarious and entertaining production within the theatre's intimate theatre venue. Joe Dowling's fine direction and superior technical support make this enchanting, romantic comedy even more alluring and magical. Hearing the Bard's delectable poetry spoken with such clarity and understanding is a real treat, not often found in classical productions these days. And, if that weren't enough, Todd Rosenthal's beautiful floral pageantry will remind audiences that romance, and some much-welcome warm weather, may not be that far out of reach." "...What can be said about Joe Dowling�s directing? Dowling is a premier international director and this is his 10th staging of �A Midsummer Night�s Dream.� Dowling was apparently determined to make the 2018 CST revival a laugh riot and a large number of opening night spectators obviously will concur that he succeeded hilariously. It�s a desolate feeling sitting silently in a theater and grimacing inwardly at a production that spectators around you are rewarding with belly laughs and applause. I remain convinced that the production was fatally undercut by directing excesses and the limitations of too many of the leading actors. Still, the first nighters roared their approval. I just wish I saw the production they liked so much." "...The lovers' antics are hilarious. A bitter Panfilio laments over Schabla's rejection. After some fairy meddling, she is no longer chasing. She's being chased by both Schabla and Phillips. Pereyra is bewildered by Phillips' sudden fascination with Panfilio. Phillips cracks me up every time he sings out Helena's name. Although Dowling tethers us to these love stories, he also connects us to the secondary stories in an imaginative and playful way. His decision to focus on other characters heightens the fun. " "...There may not be too much greenery outside this time of year, but one wouldn�t know it inside Chicago Shakes, where their production of the Bard�s A Midsummer Night�s Dream has turned the Courtyard Theater into a dazzling, outsized hothouse." "...It�d be a sad state of affairs if Chicago�s own Shakespeare-centric theater couldn�t pull off a solid production of one of the writer�s most beloved plays. Thankfully, Chicago Shakespeare Theater here continues its run of inventive, imaginative, impressive productions with A Midsummer Night�s Dream, beautifully and hilariously realized and highly recommended as a bit of extravagant escapism this winter." "...The Shakespeare Theater Company is one of the jewels in the crown of Chicago theater and for that reason must be held to the highest standard. In this case they definitely lived up to their reputation." "...It is never easy to tackle a show as well-known as A Midsummer Night�s Dream and make it yours, but Dowling and Chicago Shakespeare Theatre simply own this play and have since he directed it for the very first CST season on Navy Pier in 2000. 2018�s Dream is simply brilliant in every way, and audiences are going to love it." "...Meet the fairies�who strut their stuff with great style (Choreography: Joe Chvala; Wig & Make-Up Designer Richard Jarvie). They are holding court for Titania, Queen of the Fairies (Alexandra Silber) in the forest where Oberon, King of the Fairies (Edward O�Blenis) reigns � and these disco dancing fairies are just one set of minor characters that just about steal the show in Director Joe Dowling�s fun oozing interpretation of Shakespeare�s A MIDSUMMER NIGHT�S DREAM now being staged at Chicago Shakespeare Theater at Navy Pier."